Space marathons are among the competitive space sports whose practitioners include astronauts and cosmonauts during their tours on the International Space Station or during their walks in space or on the moon. Audio-visual contact with the International Space Station brings Earthlings news of Timothy Nigel Peake, European Space Agency astronaut from Chichester, Sussex, England, completing a space marathon. Major Peake’s successful competition April 24, 2016, in the 42.195-kilometer (26.219-mile), 36th London Marathon counts as the second space-based participation in a world-famous long-distance running event. Sunita Lyn Williams of Euclid, Ohio, deserves honors as the first space-based marathoner during a 1998 National Aeronautics and Space Administration Group-selected membership of Expedition 14. United States Navy Captain Williams’ pioneer run April 16, 2007, endows the 111th Boston Marathon with the status of first long-distance race with a space-based participant. Tim Peake tweets: "Hello #London! Fancy a run? :) #LondonMarathon"
The London Marathon website furnishes completion times of 2:03:05 to men’s elite race champion Eliud Kipchoge and of 2:22:58 to women’s elite race champion Jemima Sumgong. It gives respective wheelchair race times of 1:35:19 and of 1:44:14 to Marcel Hug and Tatyana McFadden, 120th Boston Marathon wheelchair race winners six days earlier. An article by Amy Willis for Associated Newspapers’ Metro newspaper online has longest finish-time predictions of 4 hours and 58 minutes for an 11:22-minute, slowest-run mile. It includes a range of predictions, with a run time of 3 hours and 30 minutes’ averaging an 8-minute mile close to Major Peake’s estimated pace. International Space Station tweets: "Congrats to @astro_timpeake for completing the #LondonMarathon in space today! Bungee cords required." International Space Station-related archives on space sports keep longer completion times in space marathons 200 miles (321.869 kilometers) above-ground for Captain Williams than for Major Peake. They list 4:23:10, equivalent to a 10:18-minute mile, as the 2007 Boston Marathon finish time for Captain Williams, 2012 Nautica Malibu Triathlon space-based finisher in 1:48:33. Records for the 2007 Boston Marathon mention a total of 20,338 official finishers, in contrast to an estimated 38,000 official participants in the 2016 London Marathon. They note official run times of 2:14:13 for men’s 2007 race top finisher Robert Cheruiyot and of 2:29:18 for women’s 2007 race top finisher Lidiya Grigoryeva. Major Peake offers in one of his pre- and post-event long-distance run-related tweets the share of having participated April 18, 1999, in the 19th London Marathon. First space marathoner: Flight Engineer Sunita "Suni" Williams, with electronically transmitted marathon bib number 14,000, runs Boston Marathon on International Space station treadmill. Astronauts and cosmonauts rarely practice space sports since International Space Station daily routines require two exercise hours against weightlessness’s impact on bone density and muscle mass. The Peake and Williams runs qualify as space marathons because of long-distance mileage (kilometrage) runs in place on a treadmill, not round a space station tract. Major Peake reveals that daily runs and space marathons on the station treadmill require donning harnesses that weigh astronauts and cosmonauts down like rucksacks and spacesuits. He says that preparation and realization are more difficult and more uncomfortable, but cooling-down and recovery less painful and less protracted, in space than on Earth. Space marathons turn out to be unsurprising choices as the first space sports since International Space Station orbits complete marathon-equivalent distances just about every two minutes. On Dec. 19, 2015, at 4:19 a.m., Tim Peake tweets days after Dec. 15 arrival as first British astronaut at International Space Station: "Support for launch was outstanding, I want to thank you all for the #GoodLuckTim messages"
Baker, David. 1 February 2016. International Space Station: An Insight Into the History, Development, Collaboration, Production and Role of the Permanently Manned Earth-Orbiting Complex. 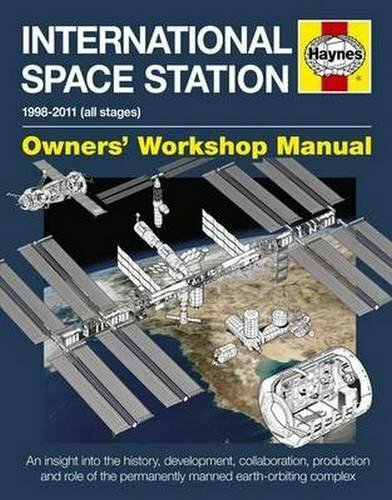 Owners' Workshop Manual. Reprint edition. Haynes Publishing, Sparkford UK. Beutel, Allard; and Hartsfield, James. 29 March 2007. “NASA Astronaut to Run Boston Marathon in Space.” NASA News Releases > Release: 07-78. Kennedy, Merrit. 24 April 2016. “Astronaut Completes London Marathon from the International Space Station.” National Public Radio > Sections > The Two-Way Breaking News from NPR > Must Reads. Schwartz, Nick. 24 April 2016. “Astronaut Runs Marathon Aboard the International Space Station.” The Buzzer. Willis, Amy. 14 April 2016. “London Marathon 2016: Date, Start Time and Everything You Need to Know.” Metro.co.uk > News > UK. Tim Peake tweets: "Shoutout to @LibbyJackson__ & @jonnyscott1978 who are running #londonmarathon in a spacesuit "
While first British astronaut donned ordinary running clothes for running his space-based London Marathon on board the International Space Station, two participants chose spacesuits for their run in the Earth-based London Marathon. Author David Baker presents the history of the world's most famous off-Earth shelter, continuously occupied for 1.5 decades. sandyspider, It's impressive how astronauts and cosmonauts do what they need to do -- they have quite a busy daily schedule -- and still take time to do something truly remarkable, like running marathons with Earthlings! This would be fun and different to do. Actor, musician and painter David Bowie, who passed away on January 10, 2016, enjoyed global appreciation of his distinctive creativity dating back to "Space Oddity" (1969). The science fiction film Interstellar correctly depicts black and worm holes, gravitational anomalies and slingshots, and space colonies and stations.